JAKARTA- Nations in Southeast Asia grouped in the Association of Southeast Asian Nations (ASEAN), share many similarities in culture and literature. Proximity within one sub-region, shared history of being colonized, level of democratization and economic development, as well as shared ancestors, ethnicity and language become factors that should necessitate the nations to meet in one literary event to discuss way to have a better future. 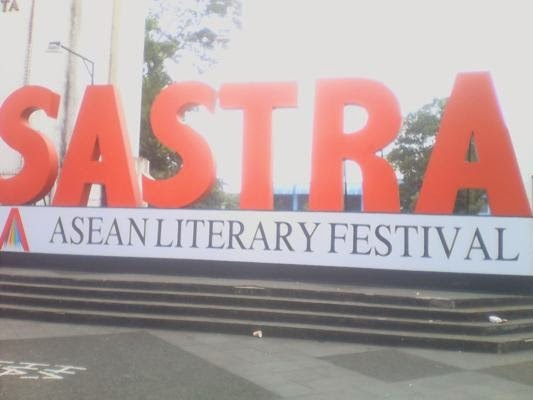 The ASEAN Literay Festival (ALF) then becomes the first event to gather all ASEAN countries, in one literary festival as one community of literature. This event held by Muara Foundation with full support from Hivos and the Indonesian Ministry of Foreign Affairs. 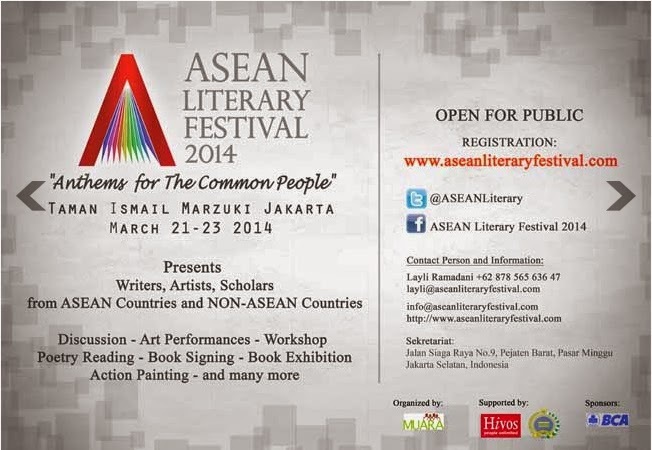 This international event will take place at Taman Ismail Marzuki Jakarta, from March 21 to 23, 2014. “ASEAN Literary Festival 2014 is being organized as a platform for writers, artists and the general public in the region to get to know one another in greater depth,” said Abdul Khalik, director of the 2014 ASEAN Literary Festival, in Jakarta. For this year, ALF carries the theme "Anthems for the Common People". It is inspired by poem “Song of the Grassroots” by Indonesian influential poet and human rights activist, Wiji Thukul. With the theme, the festival wants to dedicate itself to become the voice of ordinary people. The event exists as a people's festival where literature and art will be brought closer to the public and celebrated by all. Beside series of discussions with topics mostly about how literature contributes to society, there will also be workshop, art performances, poetry reading, book signing, book exhibition, children’s literature, writer’s corners, publisher’s corners, community corner, and many more. “We intend to hold more than just an event, but we are here to build a tradition,” said Abdul Khalik. The festival itself seeks to become a medium to show appreciation to writers and introduce them to wider international audience while being one of the bridges to get people of literature and the public in the region to know each other. More than 40 prominent writers, scholars and artists from most of ASEAN countries and non-ASEAN countries such as China and Australia, have already confirmed to attend the festival, which is free and open for public. Also, more than 600 people from across Indonesia and the region have confirmed to participate in the thee-day event, a surprisingly high interest to a literary festival even when the organizer have not started to conduct real publication. One of ASEAN’s best literary figures will deliver a general lecture on the contribution of literature to the society at the opening of the festival. For details of the event, please visit www.aseanliteraryfestival.com. And you can register via Press Registration also.